One of the last public tasks that ARC CEO Aiden Byrne undertook before leaving to take up his new UQ Provost role, was to release the 2015-16 institutional insights report on the state of university research. Drawing upon the 2015 ERA results, the report presents a range of tables and charts on performance which allows for comparison by institution and FOR code. 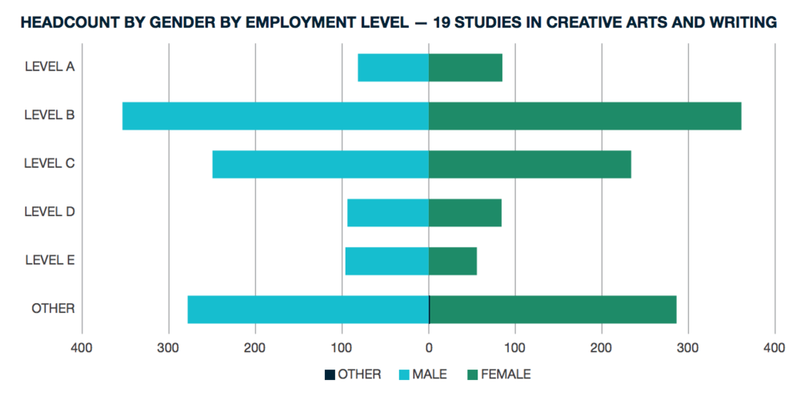 The report shows that, although there are variations at FOR four digit level, the number of units of evaluation rated at and above world standard for creative arts (FOR19) have fallen each ERA round from 2010 in contrast to the majority of other FORs which have increased. Detail on FOR 19 also shows gender and academic employment level breakdown, (Pic 1) and the volume of outputs by institution (pic 2) as well as the contribution to national landscape. The full report is available at this link (pdf).